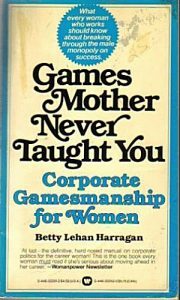 Betty Lehan Harragan’s wonderful book Games Mother Never Taught You: Corporate Gamesmanship for Women was published in 1977, at a time when the first generation of women were trying to rise through the ranks in corporate America. It was a primer for these would-be executives, who found themselves baffled and frustrated by a set of mysterious rules of the game that all the men knew to follow. They played their positions and scored, while the women fumbled and dropped the ball. Aside from revealing these unspoken rules, Harragan offered brilliant advice to enable women executives—whose mere presence was then an unsettling anomaly in a corporate workplace—to avoid inadvertent behavior that would disturb men even more. One of her cautions: never bring your purse into a meeting or business lunch. Men, Harragan explains, unconsciously equate a woman’s handbag with her womb, and seeing it in a business setting disorients them. A purse is acceptable when a woman is present as a sexual/reproductive object. But the message it telegraphs in a business setting is fatal to her attempt to be accepted as one of the team. I don’t know what other projections Ethan Crenson heard that day, but I’ll bet there were a lot of them. Like a womb, an empty space has a generative power. Previous Post:My Girls Write Now mentee in Newsweek! How fascinating to be reminded again of the chasm that divides men from women! As you know, I work as a volunteer teacher at the University of California-Davis’s Raptor Center, and so few men are on my un-paid team that I forget these things. Few men, too, are the school teachers and librarians who request a visit by enthusiasts for another species. 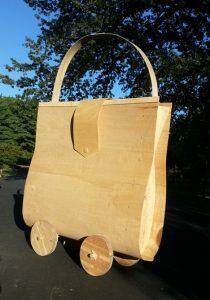 When I saw the wooden purse, my immediate response was joy. It’s a wonder, it’s magic. It’s a symbol of Mother Goose. I thought of all the purses I have known, filled with bits of string, coins, creased and fingered letters, lists, pencil stubs, dust, safety pins, a single earring, a bottle of pills (unlabeled), a Kleenex, a lipstick – I’ve always loved purses for their mystery. Imagine my shock, then, many years ago, when my 11-year-old daughter up-ended mine and then – gasp! organized it! There wasn’t much left after she tossed the inconsequentials. I love this giant purse. I’d like to crawl in it and remember my grandmother’s, my mother’s, my foster-mother Lila’s – all rich mysteries of childhood. A very interesting comment. I remember “Games Your Mother Never Taught You” very well.